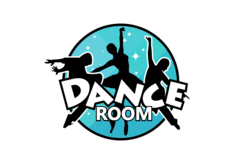 The Dance Room Parties are a fantastic way to celebrate your event. 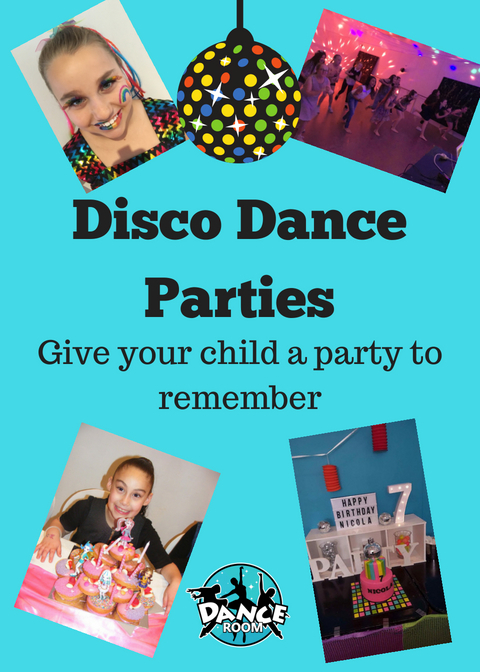 We take the hassle out of organising the perfect party for your child. One of our dance studios will be transformed into a wonderful party room all set up and ready to go in your chosen theme. We will have the children moving and grooving around the floor. Your child will recieve a party host who will host a dance party and play a number of age appropriate party games and activities. We will give your child a party to remember. For Children aged 3-5 years, we offer a magical party with a character host. 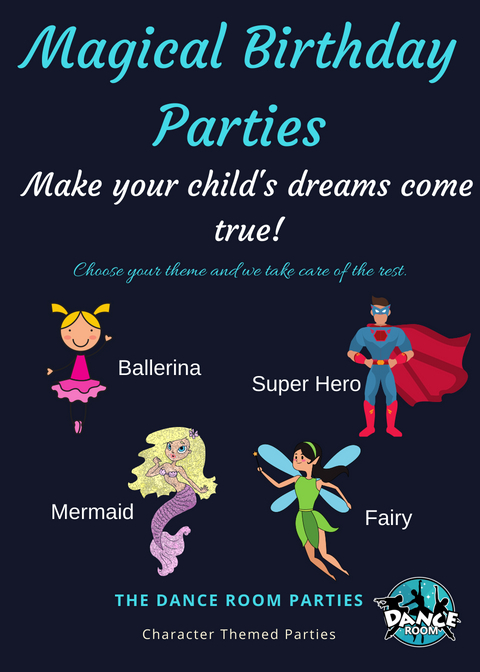 The birthday child can choose from four magical themes, Superhero, Mermaid, Fairy or Ballerina. We will provide an 1.5 hour party, set with table settings and party food. You do not need to lift a finger. For Children aged 6-14 years. We offer an amazing disco party with lazer lights and the latest music. Children will have a 2 hour party with a party host and play a number of party games. We provide a beautiful table setting in your chosen colours. Cost: $300 (10 children) additional guests $25 per head. Includes hot food & party bags. 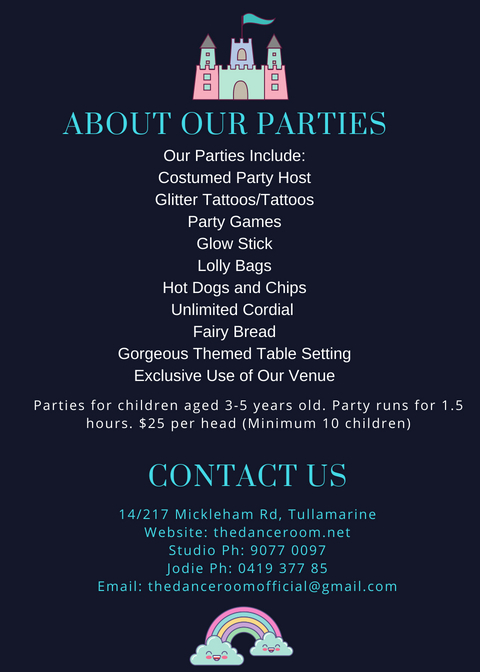 Parties are held at The Dance Room Tullamarine - 14/217 Mickleham Rd, Tullamarine. During school holidays more party times are available. Do you have a large number of children? Do you want to cater for your own party? Exclusive use of the venue for family and friends. One staff member will be at the venue to assist with party needs. 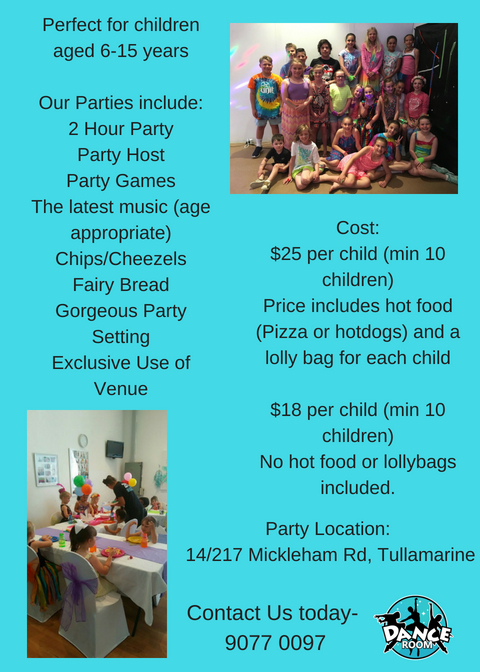 We can also arrange for a party host to keep your children entertainined throughout the party at en extra cost. Want extra time? Extend your party for $100 per hour. Hire a party host: $50 per hour. **Parents arrange their own party food and are responsible for clean up at conclusion of party. No food other than the food provided is allowed to be brought to the party, with the exception of a birthday cake.